Which quadrant are you living in? Do you ever get so busy you don’t have time to think? I’ve found that a huge red flag, reminding me it’s time to step back and re-evaluate where I’m spending my time. Right now, my plate runneth over—with wonderful things like the Angel Falls book launch (and a few not-so-wonderful things)! But either way, there are too many items on my list. I know because I keep running out of day before I run out of to-do list. 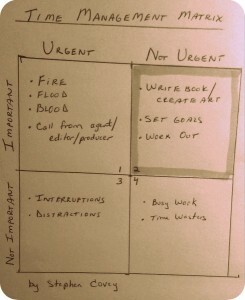 Listening to my car radio the other day, the hosts were talking about time management and mentioned the late Stephen Covey’s Time Management Matrix. It prompted me to do a quick refresher of this handy, eye-opening approach to time management. In case you’re not familiar with it, here’s my quick sketch of Mr. Covey’s matrix, with some examples of what might be in those different boxes. Urgent AND Important—These are the DO IT NOW items. The house is on fire and the baby’s bleeding into the rising flood. Or an agent/editor wants to talk to you. Important but NOT Urgent—These things are hugely important to us, but they’re not urgent, so without planning, they never seem to get done. Unless we give this box the time and attention it deserves, we’re not going to reach our dreams. Urgent but NOT Important—These are the distractions and interruptions that highjack our lives and schedule if we’re not paying attention. Sometimes, they really belong in the urgent-and-important category, but often they can be put off, condensed, or eliminated entirely. NOT Urgent and NOT Important—These are the time wasters (online games, anyone?) and busy work that don’t have to be done anytime soon. Maybe never. Ideally, we get rid of these. I’ve learned that when the urgent shoves the important out of the way, it’s time to take another look. Right now, I have my red pen out and I’m crossing things off the list BEFORE I do them. Some will get moved to “later.” And some will go onto the “maybe someday,” list. How about you? 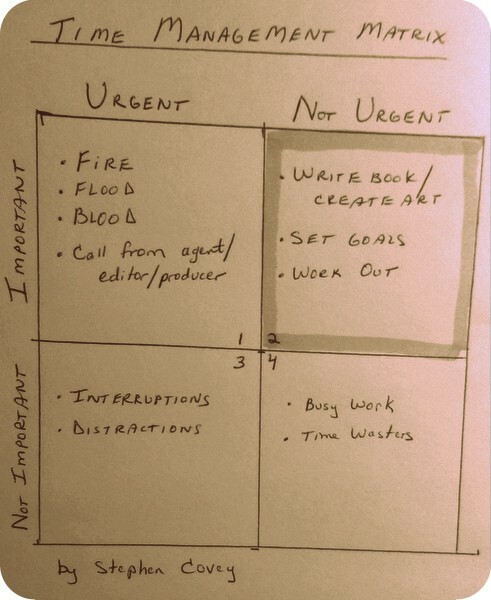 Which quadrant are you spending most of your time in? How do you make sure # 2: “Important but not urgent” doesn’t get ignored? I’d love to hear your ideas! And if you haven’t joined the Angel Falls online Launch Party, there’s still time to join the fun. Just follow this link and hit “join” on the event page. There are contests and giveaways and all kinds of fun. I’m revealing the Angel Falls video on Thursday–can’t wait to share it with you! Mine is simply a very long list, numbered, which I update about once a week. Strangely, some items stubbornly refuse to get deleted, but then again whilst they never get done, they’ve reached ‘list status,’ which will just have to be good enough for now. Hi Maddy–glad you have a system that works for you! That’s really what matters. Being intentional about how we spend our time!